They're doing it in part, because Richer knew, and even mentored, one of the officers killed that day. But they're also doing it, because as Kim Richer says, "It could have been us." The couple raised their three children overseas, a common experience for those serving in the agency. The Richers say they didn't tell their kids what Daddy did for a living until they were teenagers, but at any time, Kim knew that she might have to tell them that their father wouldn't be coming home at all. For those who don't know, the CIA is a rather small agency. Most of the people know each other, so when one of them is injured or killed, the community comes together. It's on that note that the couple made the decision to launch their cross-country memorial journey. Their training included taking long daily bike rides, dramatically changing their diets, paying attention to vitamins and supplements, and sometimes letting mundane tasks such as laundry and housecleaning fall by the wayside. It seems to be paying off. The Richers' website, www.pedalingforpatriots.com, lists a number of private and corporate sponsors, and they've attracted the attention of two former presidents as well. In a letter to the Richers, former President George H.W. 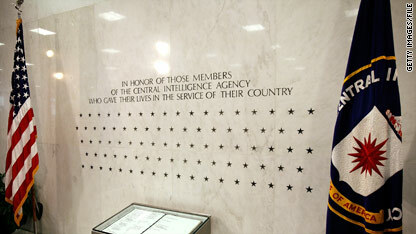 Bush, himself an ex-CIA director, said, "It is fitting that your 'Pedaling for Patriots' journey begins on September 11th - a date that reminds all Americans not only of the need for constant vigilance, but also of the sacrifices made by the men and women of the CIA whose life's mission is to keep America safe." While the CIA isn't officially supporting the ride (because the agency just doesn't do things like that), there is a lot of good will and appreciation inside the building, so to speak. The loss of so many officers in one attack is something the agency will be feeling for quite some time to come. The Richers are documenting their journey on their website. They say they plan to roll into San Diego on October 27 to dip the front tires of their bikes in the Pacific Ocean. It will be the end of their journey perhaps, but not their mission. Great job. Good luck in your new mission.